No time in the church year has richer symbolism than Advent. Technically, though many credit Martin Luther or the early Lutherans/Germans for the tradition of the Christmas tree, the trees in nearly all of our synod’s chancels at this very moment are Chrismon trees. Chrismons, or “Christ Monograms,” now popular worldwide and across denominations, are even (adapted, of course, and with a different name) being used in synagogues as well. It started with Mrs. Spencer and the Lutherans at Ascension Lutheran Church in Danville, Virginia in 1957. To read more about the history of Chrismons and critical connections to the chief supplier of Chrismon designs and materials to this very day located just a couple of miles from our synod office, see this link. My wife, Wendy, and I visited again the week of Thanksgiving and it’s a magical place. It’s not only a great place for ideas and purchases of Chrismons and other decorations founded and operated by a local Lutheran family—the Ruftys—it’s a fun place to take church groups for a guided informative and inspirational tour. Chrismons, though practically used almost exclusively during the liturgical Advent and Christmas seasons, really would be appropriate any season of the year. 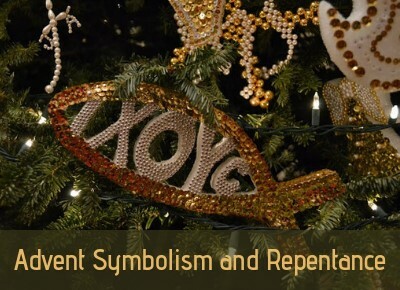 If we’re true to the Advent season, a number of the chief symbols are quite disturbing. How many of you, I wonder, have an axe hanging on your home tree? I like to look at Chrismons when I visit congregations in December, and rarely can I ever find the axe, even though John the Baptist proclaims every year in our Advent lectionary that “even now the axe is lying at the root of the trees.” How many of you have sent, received, or seen holiday cards with John’s pre-Christmas message: “You brood of vipers! Who warned you to flee from the wrath to come?” (“And a very Merry Christmas to you and yours!”) No, cultural Christmas screams cute, warm, and fuzzy—and John qualifies only for fuzzy. John’s announcement is of impending judgment, as is ours every time we announce in the creed that “(Christ) will come to judge the living and the dead.” The universal question to John in light of this reality is simply, “What should we do?” How do we watch, wait, and prepare the way? John’s answer is to “bear fruit worthy of repentance.” More specifically, his exhortation is to share. If you have two coats, share with the one who has no coat. If you have extra food, share with those who have none. That’s all nice theoretical language, isn’t it? I just counted my coats in my closet again, and I don’t have two—I have nine. I’m betting most of us have more than two coats, including probably one we haven’t worn in three or more years. As part of our Advent penitential discipline, why not do some housekeeping, cleaning, purging, from our over-abundance in order to share with those who don’t have basic needs? Your local congregation, food/clothing closets can probably help you find a good way to share. Such acts will not, of course, make us righteous before God, but they are small yet tangible fruits worthy of repentance, of emptying ourselves just a bit in order to prepare room for the coming one.